My Shar-Pei puppies are some of the most sought after in the entire world. The Baggins bloodline produces beautiful, healthy dogs that are beloved by their families. After 30 years of delivering wonderful companions to families all over the world, I have a waiting list of happy owners who are addicted to our puppies. Once you've had a Baggins Shar-Pei puppy, you may never be satisfied with any other dog again. I tell all new potential owners that they will probably have a second Shar-Pei within the year! My puppies are usually pretty plain when they are young and just get better as they age - more bone and breed type. 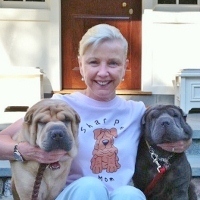 My puppies are late bloomers - meaning they wrinkle later but hold more wrinkling as adults than most. I want to be sure that wherever I send a puppy it is first going to be a family house dog. I do not want to send a puppy to be outside in a breeding pen just having puppies every heat cycle. Read more about how to get a Baggins Shar-Pei, the Baggins Guarantee or our prices. Take your time and do your research. Don't be in a hurry. Look at the parents and related adults for an idea of what the puppy will look like when it is full grown. Do not buy a very young puppy if you really want a good idea of size. Often the runt of the litter is small due to poor nursing, but grows rapidly when weaned onto solid food. The later a Shar-Pei puppy puts on his wrinkling the more he usually will have into adulthood. Read more about Shar-Pei health to understand which issues you should be concerned about and which you should not. "Our 2 yr. old Isabella that I bought from you almost 2 yrs. ago now is PERFECT in every way"